Approximately 400 calories per hour (compared with 280 calories for normal walking). Energy consumption increases when using poles by an average of 20% compared with ordinary walking at the same speed without poles. Heart rate is 5-17 beats per minute higher. Up to a 46% increase in energy consumption when fully utilising the correct technique. You can walk for extended periods and not feel exhausted because you are utilising more muscle groups to propel you. Reduces the load on knees and other joints. Improves balance and co-ordination. Releases pain and muscle tension in the neck/shoulder region. Charles Dickens walked 20 or 30 miles a day! Fredrich Nietzche believed walking was necessary for his writing. Stanford University has revealed that walking boosts creativity by 60%, so Fred was on to it! Einstein, Tchaikovsky, Aristotle, Wordsworth, even the Romans took long walks. The links below describe the reasons these historical figures incorporated walking into their daily routine. The antecedents o f the marathon originate in 490BC when the Greeks were at war with the Persians. When The Battle of Marathon was won, Pheidippides, an Athenian herald or "day-runner", was despatched to Athens to announce the victory. He ran the 40 kilometres from the battlefield near Marathon and on his arrival, and with his dying breath, said "Joy to you, we've won". The first modern Olympics was held in Athens in 1896, and included the marathon. Marathons have been part of world-wide athletic endeavours ever since. 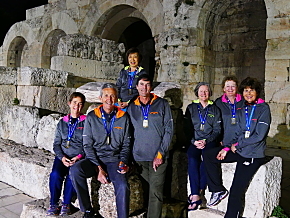 Following in Pheidippides footsteps, a dedicated team of Auckland Nordic Walkers set the training goal of participating in the 2018 Authentic Athens Marathon. This course followed the main highway and is relatively flat. Despite being late Autumn, the day was very hot, with the sun directly overhead and little shade. Measures to keep cool and walking at a slower pace ensured that everyone successfully completed the event in good shape. 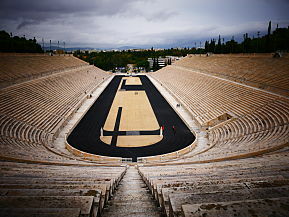 The highlight was the finish at the 2500 year old Panathenaic Stadium, which is an amazing venue. It is the only stadium, in the world, built entirely of marble.